I spent Monday at Microsoft, a relatively humble, relatively quirky, and relatively confident company. Satya Nadella, just shy of five years into his tenure as Microsoft’s CEO, is well aware of the world’s view of his company’s rejuvenation—and he refuses to gloat out loud. “When you have major franchises that run out steam,” he says, referring to Microsoft’s once-dominant Windows software, “to reinvent yourself is hard work. I’m always looking for inspiration” from companies that have done it. 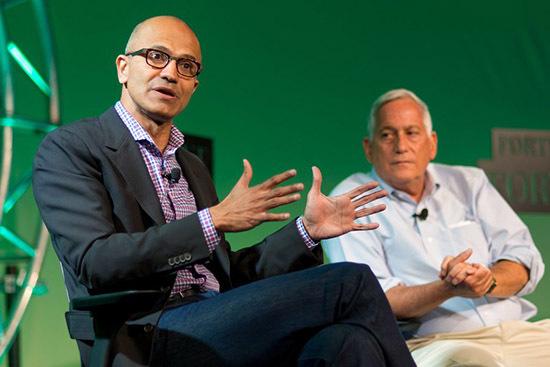 Nadella spoke to a small group of journalists at the beginning and end of a day packed with evidence of Microsoft’s uniqueness. Peers like Apple and Amazon share relatively little with the world until the day they’re ready to sell it. Microsoft, by contrast, offers glimpses of seemingly every idea that might be its next big thing, from “magic window” two-way display technology to quantum computing to its HoloLens “mixed-reality” platform. To its great good fortune, Microsoft several years ago hit on a replacement to its Windows franchise, the multi-faceted Azure cloud-services business that is No. 2 to Amazon’s market-leading product. (On last Tuesday, Microsoft announced its latest cloud services win, signing Walgreens Boots to a multi-year deal.) Azure, in turn, is the center of Microsoft’s “intelligent edge” strategy: Every potential hit device and service leverages and feeds Azure, the company’s growth engine. The company’s resurgence and the evaporation of animosities once endured in global capitals allow it to be a policy leader on multiple fronts. President Brad Smith spoke last Monday at length about what the tech industry can do to alleviate societal problems, some of which technology and its companies have exacerbated. He says Microsoft sees three ills it will address through policy means: access to technology, particularly broadband in rural America; the gap in technical skills among the poorly educated; and challenges posed by explosive economic growth, notably the lack of affordable housing in the major urban areas where tech does business. On last Thursday, Microsoft plans to announce an initiative it is leading in the Puget Sound area to add to the housing supply. Microsoft faces plenty of challenges. The track record of its smaller bets is poor. It sees a future of “seamless” computing but doesn’t have a position in the critical smartphone market. A global economic slowdown would hurt it along with everyone else. And yet, in a physical and metaphorical sign of its rebirth, Microsoft is tearing up huge swaths of its suburban Seattle campus to build new buildings, underground garages (cars will disappear from the main campus), and eco-friendly links to public transit. But it’s tough to remember anymore when Microsoft was the most hated company in tech or the flattest of doormats either. Other companies could do a lot worse than humble, quirky, and confident.